A quick Sneak-Peek of GRAVE WITCH and the KISS of DEATH winner! 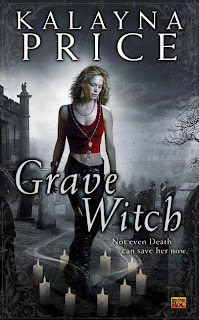 Well, you've been asking for it, and I have permission, so I am now releasing the first sneak-peek of Grave Witch. The book is still a little over five months from release date, so I only have permission to release a very short except, but I hope you enjoy this quick preview of the book. Closer to the release date I should be uploading a longer excerpt (hopefully I will get permission to release the entire first chapter). By the way, if you will be at ComicCon 2010, you will be among the first to read the first chapter as my publisher will be giving it out there. Be on the lookout! Now, without further ado, please click here to read the excerpt. Enjoy, and check back often for more updates! If you haven't entered to win a copy of Rachel Caine's KISS OF DEATH, scroll down. Several people have asked for more information about the actual panels I sat on at RavenCon, so I thought I'd expand on a couple here. As I mentioned previously, I was on roughly a dozen panels during RavenCon. I'd be hard pressed to pick a favorite, though a couple stick out, so I'll highlight some of the discussions here. RavenCon recap part 1, and a giveaway! Ahm. Yes, the silence here on the blog hasn't been broken in a couple weeks. Sorry about that. I have been juggling projects, deadlines, travel, and a hoop dance performance. Blogging fell to the bottom of the list, but I should be back now. I have several topics I want to talk about, not the least of which is a recap of the marvelous time I had at RavenCon, but I don't want to overwhelm everyone, so I'll be breaking the posts down to manageable chunks.